Once an Enrolment is sent to the eCAF System you need monitor and process eCAFs. You may also need to Change the eCAF. You can view eCAF Status via the eCAF Report Section, an individual Course Enrolment or via the eCAF system. Enrolments Pending eCAFs. Displays all Course Enrolments that still require students to submit their eCAF forms. Click on the eCAF ID number and follow up with the Learner as needed. This means that the Learner has submitted their eCAF but it requires processing in Wisenet to ensure that all of the required fields are set. If possible do not manually process from within the eCAF system else the Wisenet integration will not be able to process the eCAF against the Course Enrolment. 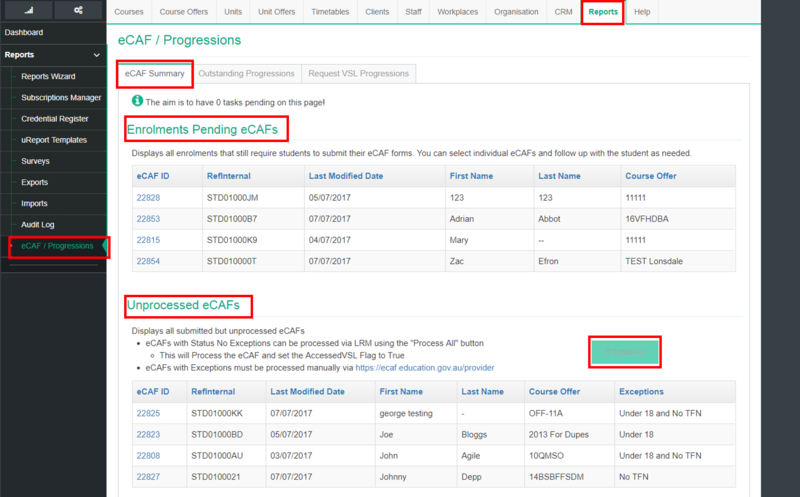 When in a VSL Course Enrolment look for the eCAF Details section. You can see the eCAF Status here. You can manually update the eCAF and VSL details from within the Course Enrolment if required. This option is only recommend when manual intervention is required due to exceptions. Login into the eCAF system and view the Enrolments or ECAF records as required. There is also a report #0813 that provides eCAF status and information. You may need to change the details of the submission if information was incorrect or a Learner decides not to proceed. Delete=Delete enrolment from eCAF system. This will only remove the Learner from eCAF if they have NOT yet been processed in the eCAF system.